I finished the mini version of my star quilt! It's headed off to a new baby soon. 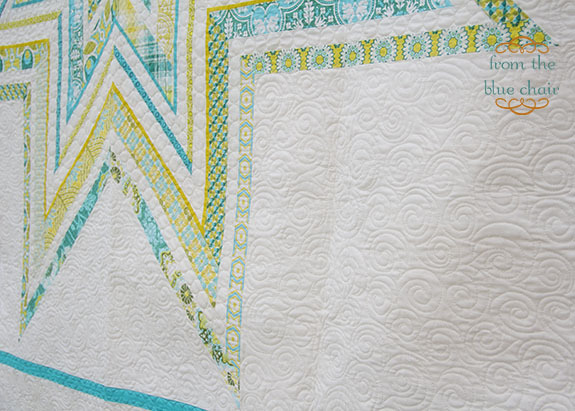 I really love baby quilts that don't scream "baby". 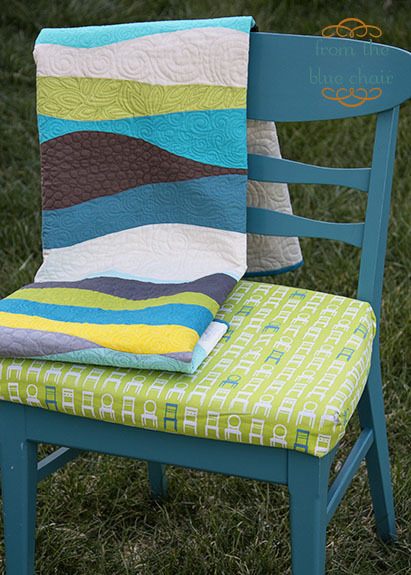 It's much more my style to give a mini version of a regular quilt. 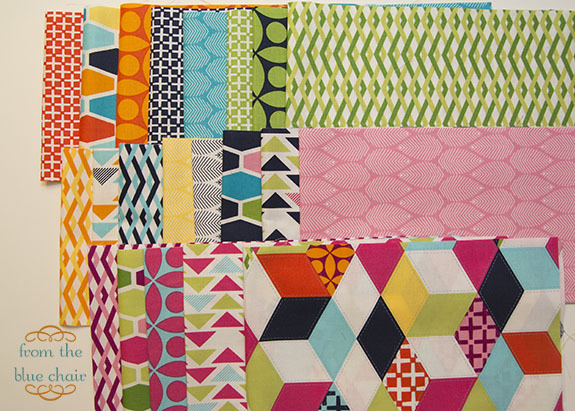 Fabrics: Technicolor by Emily Herrick (prints), Solids are various Art Gallery and Kona solids to match, Background is Kona white. 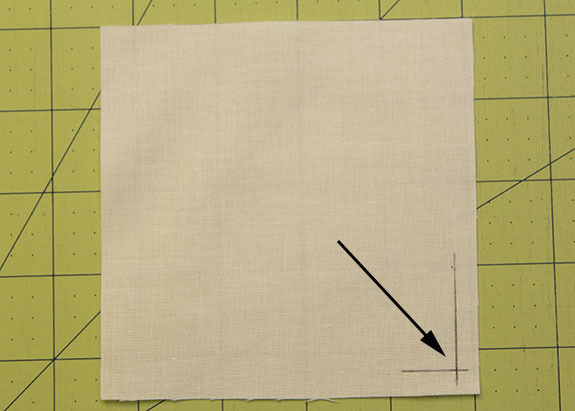 Background Fabric Cuts: Measurement "A"= 19"; Measurement "B"= 13" (See Tutorial 3 so these numbers will make sense). The back was a fun experiment with some scraps. Rain prohibited me from getting my standard quilt on the blue chair picture. Hopefully, I can add that in before it is gifted. 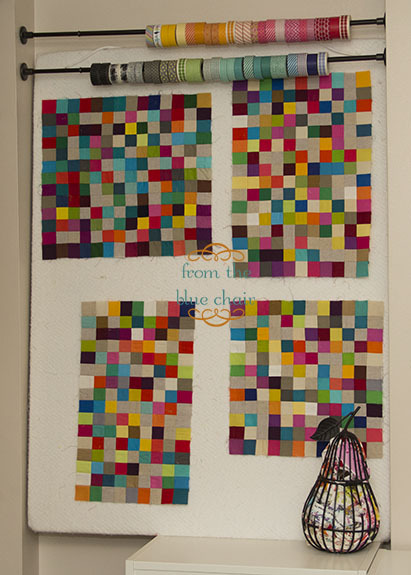 Recently, Emily from Crazy Old Ladies Quilts sent me some strips of her new fabric Technicolor that she just debuted at Market. Emily started attending the SLMQG a few months ago, and it's been fun getting to know her. I really love this line. It's actually a lot like Emily--fun, bright, and cheerful. The line is pretty much full of great blenders. Each individual print is great, and they all work really nicely together. I love the simplicity of the designs. In general I work with a lot with tone-on-tone and tone-on-white fabrics. These work perfectly with my preferred style (and will fit nicely into my stash once they officially release next month). 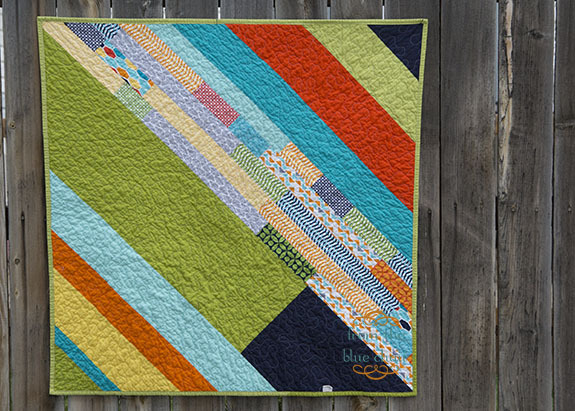 I thought the blues, greens and oranges would be perfect for a non-baby-ish baby quilt I wanted to make for a friend. I didn't have a lot to work with since the strips I got were about 5" x 18". I decided to make a mini version of my Jumbo Star quilt and paired it with coordinating solids. I'm still in love with this star design. It's just fun to make. This little guy will finish at about 40" square. Here's the beginning of the quilt back. This is something new I've never tried before. 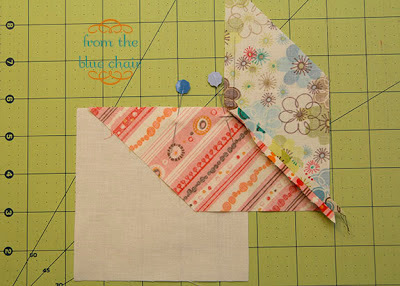 I'm really liking it and am using up all my scraps in the process. 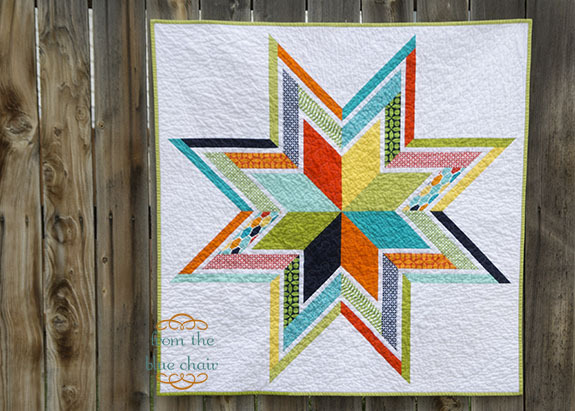 This is the last tutorial in the series for creating your own Jumbo paper pieced star quilt. The first tutorials are located here: Part 1 & Part 2. 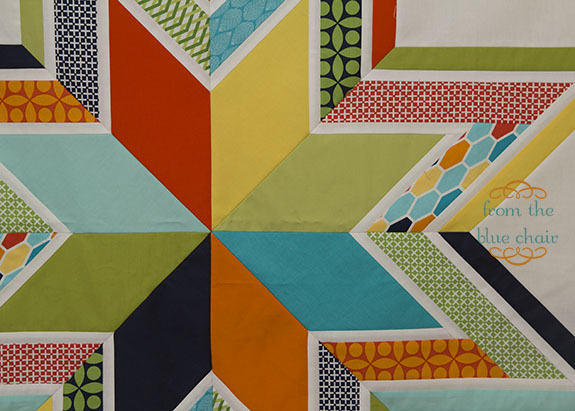 There are a couple different ways to finish this quilt, but I prefer as few seams as possible for the appearance of the quilt so I sewed mine with partial/set-in seams. First, cut the background fabric. Measure your diamonds as shown. To get the "A" measurement, simply lay two diamonds next to each other as they would look once stitched. Measure point to point and add about 3". It doesn't need to be super precise, but you definitely want it too big rather than too small. You can always trim. 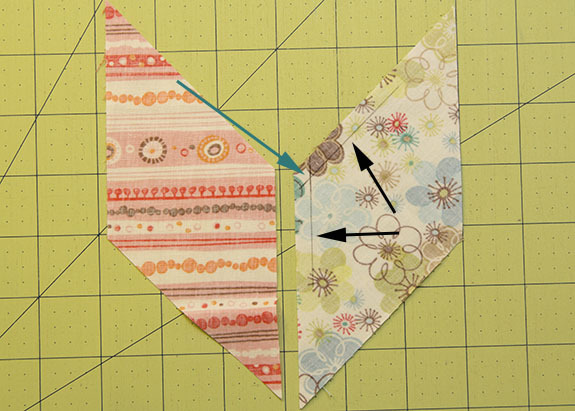 Cut one square using measurement "A" as the side length. Subcut this piece as shown, making (4) right triangles. This will likely be a large piece of fabric. 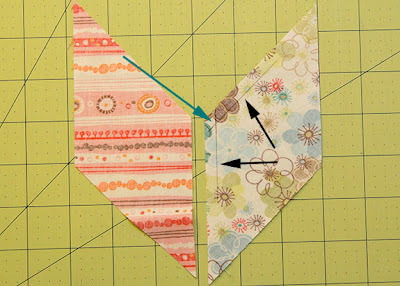 Use a yard stick to mark the lines before cutting. It's critical that the 90 degree angle of each triangle is a perfect as possible. After cutting remeasure with a large square ruler and trim slightly if necessary. For measurement "B", simply measure the side of a diamond and add about 2". Cut four squares using measurement "B" as the side length. Next, start by sewing the diamonds into pairs. Refer to the picture below. 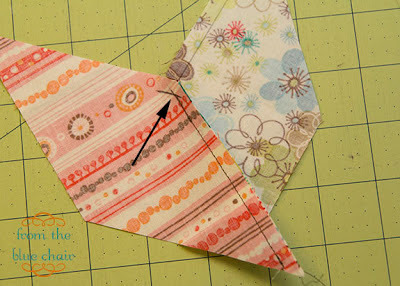 We'll be using this same diagram throughout the tutorial for the order of stitching. 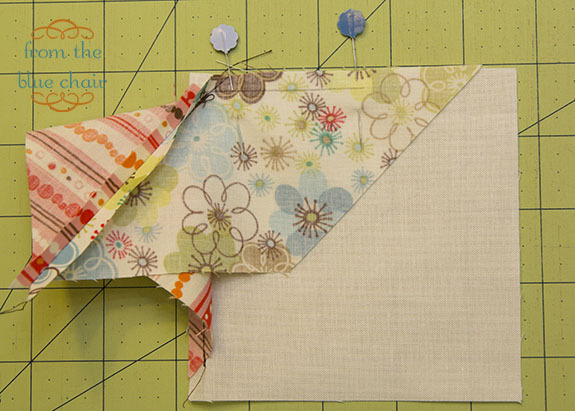 Sew 1+2, 3+4, 5+6, & 7+8. Mark each diamond with a removable fabric marker as shown. Mark a 1/4" line on wrong side of fabric along both sides of the wide angle on the diamond. Begin stitching at the intersection of these two lines. 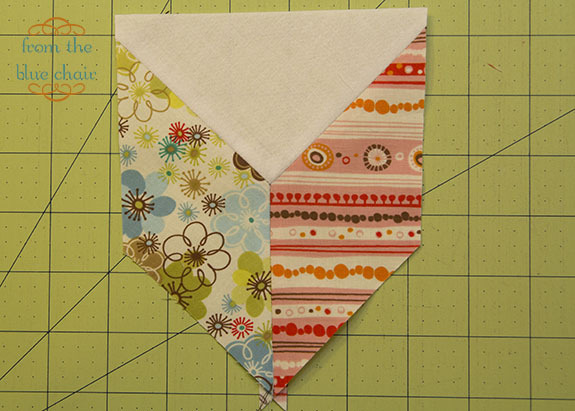 Pin two diamonds together, pinning where each border meets to ensure seams will match once completed. End the seam at the bottom of the diamond. Backstitch well on both ends. Press all seams open. Repeat with all diamond pairs. (All inside angles of star will be stitched in this fashion). Next stitch the triangle background pieces to the diamond pairs (9, 10, 11, & 12 on picture above). Mark 1/4" lines on inside right angle of triangle (Example done using a square. Instructions are the same for either the side triangles or the corner squares). Match intersection point on background piece with the point where stitching stops on diamond section. 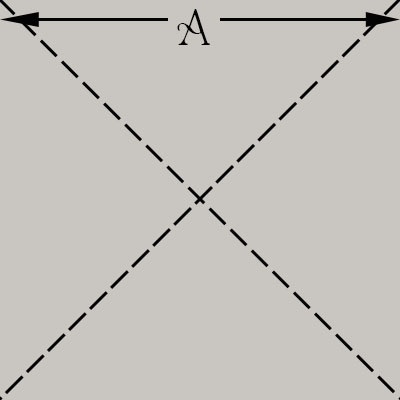 Stitch across length of diamond. 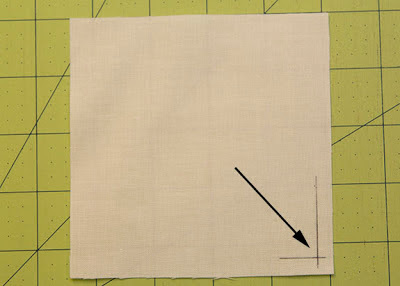 Stop stitching at marked intersections (where stitching began on diamond section). Repeat with other side of diamond section. When stitching the triangles. Trim triangle points even with diamond edges. 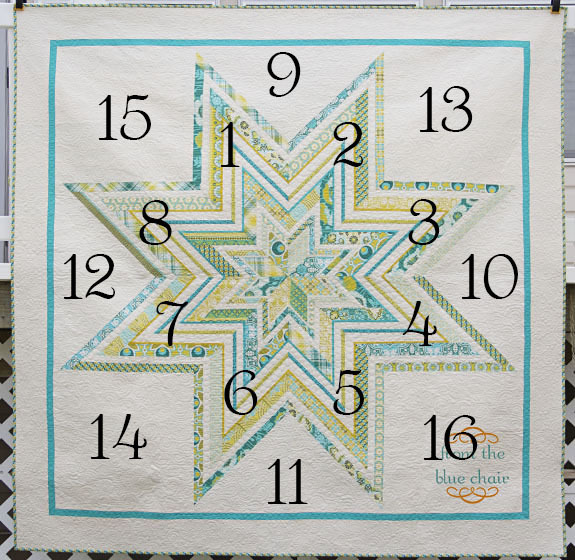 Stitch diamond pair 1,2 to triangle 9; 3,4 to triangle 10; 5,6 to triangle 11; 7,8 to triangle 12. Stitch pieced sections 1,2,9 to 3,4,10; 5,6,11 to 7,8,12. Stitch halves together. 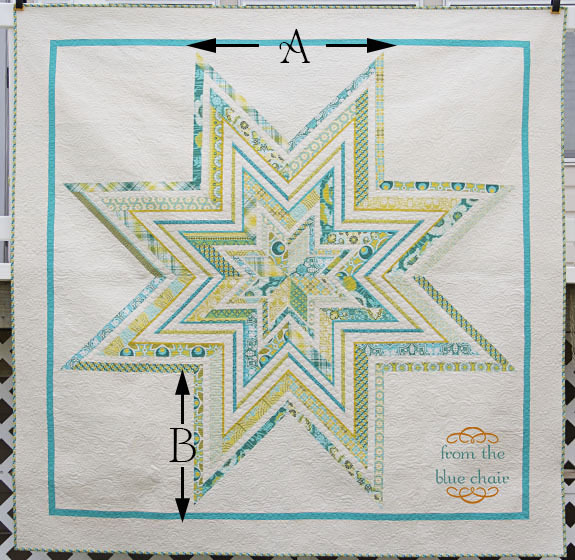 When joining the halves of the star, match and pin the center point first. Stitch with a basting stitch along only the center few inches (between the arrow points). If everything matches up, then pin the remaining length of the seam and stitch. If the center point doesn't match, unpick basting stitches and retry. 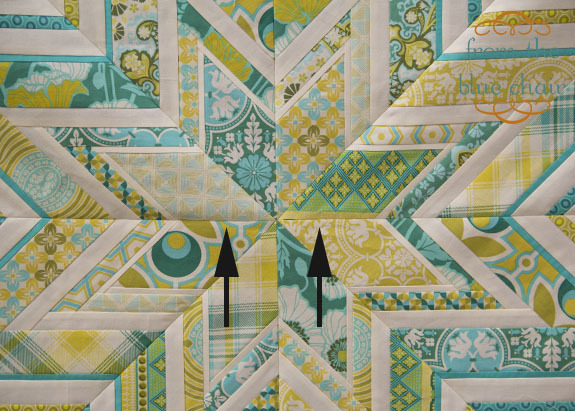 Matching the center points is critical to the overall appearance of the quilt. Stitch squares 15 and 16 to finish quilt top. Press all seams well. Trim edges to square quilt. 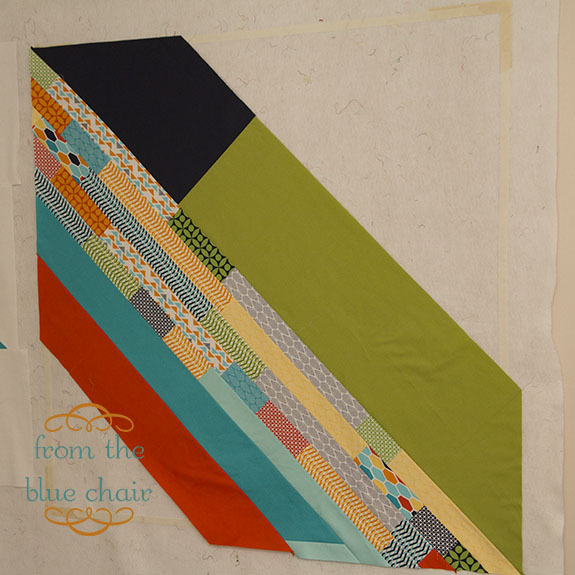 Add borders if desired and finish quilt. I have a new project up on the Pellon Projects site! A project highlight is also on the Pellon blog. 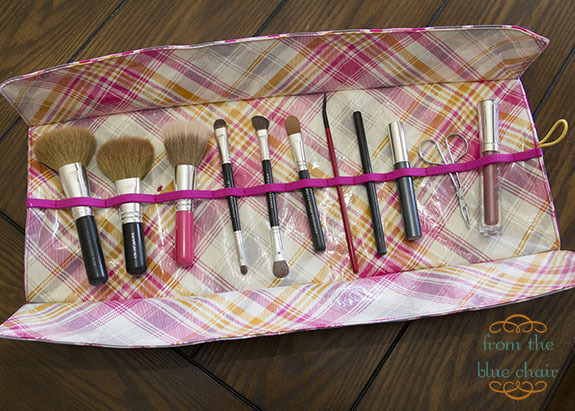 This is a make-up brush case I created for traveling. In the past I've always thrown my brushes in a make-up bag, and they seem to end up dirty and smashed together by the end of the trip. This is a simple project that comes together so quickly. This pouch is lined with fusible vinyl and has stitched flaps to fold over the brushes, keeping them separated and much cleaner. I'm excited to use it for a few family trips we have planned this summer. 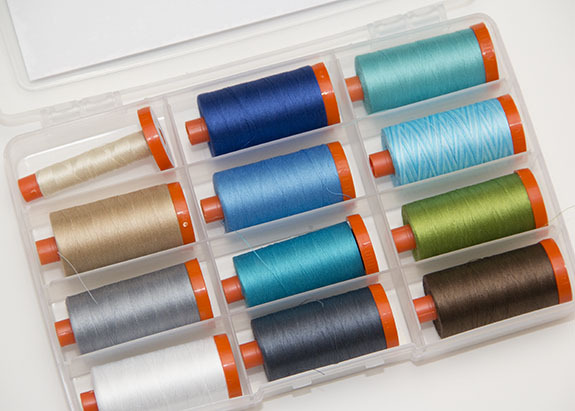 I was given the opportunity from Lynne over at Lily's Quilts to create something using this beautiful box of Aurifil thread. 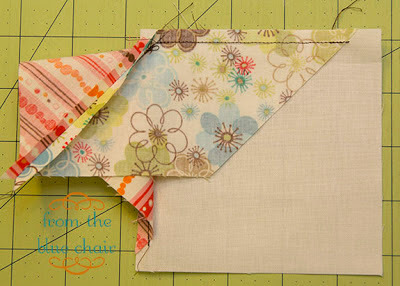 I did a simple tutorial over on her blog showing how I created these layers of fabric. I should have taken the picture before I used up all the cream thread. 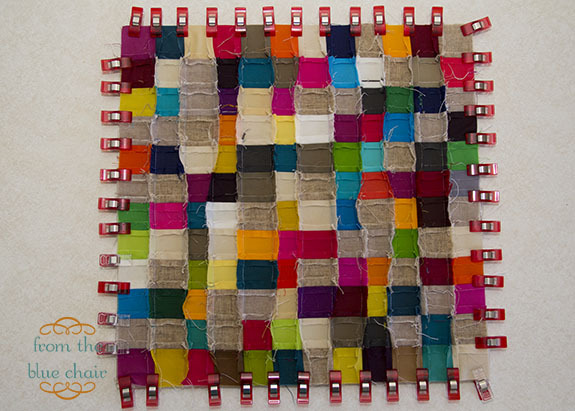 I pulled all my colors for this quilt straight from the thread box. I chose to stick more with the aqua blues rather than the true blues. The title of the thread collection is Seascapes. I kept that in mind as I put this together. 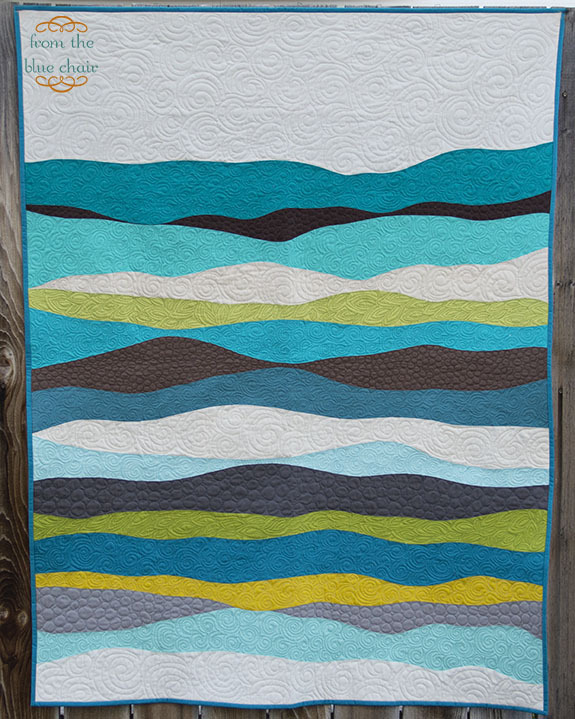 My ultimate inspiration for this quilt happened to be those layered colored sand creations that most of us made at least once when we were kids. 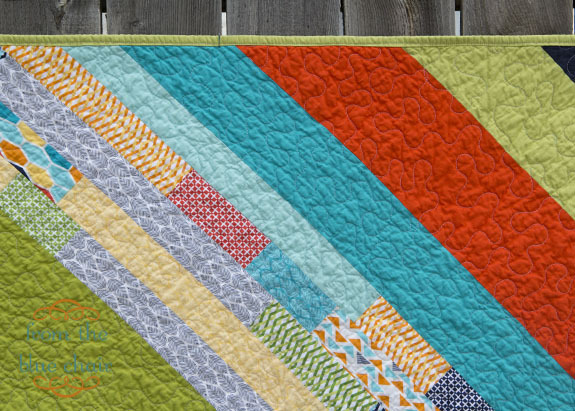 I'm simply calling this quilt "Layers". 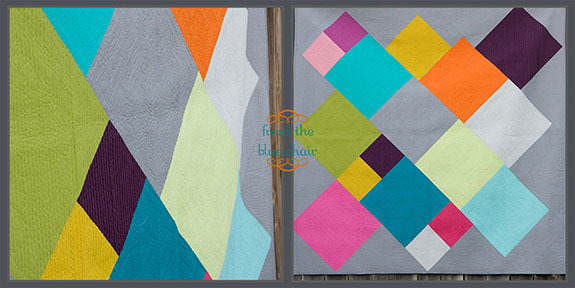 The creative process of this quilt was quite meditative for me. As I cut each layer and sewed I thought about my own personal "layers" as well as those of my kids. We are each made up of so many attributes or layers--both good and bad, but together they make each person beautiful. The dark brown and grey layers alone wouldn't necessarily be called beautiful, but without them, this quilt would be pretty bland. Without our quirks, we would all be pretty bland too. I'm trying to keep this in mind lately as my kiddos have been testing me more than usual. 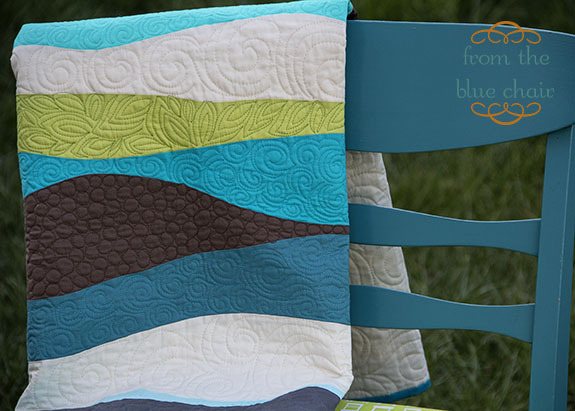 Keeping the attributes of the sea in mind, I quilted each fabric according to it's specific attribute in a "seascape". 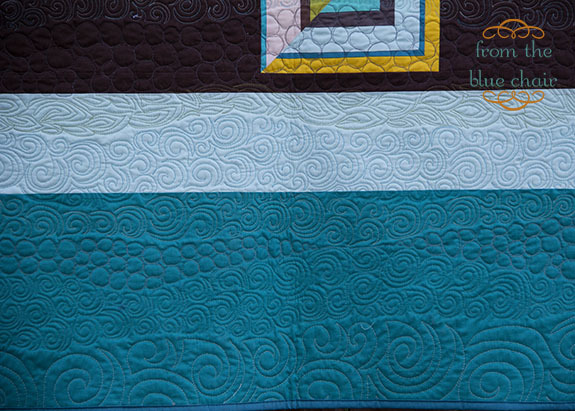 I quilted blues with a dense swirl forming waves. The two browns were quilted in very small, dense pebbles representing sand and dirt. The greys are quilted in larger pebbles representing rocks. 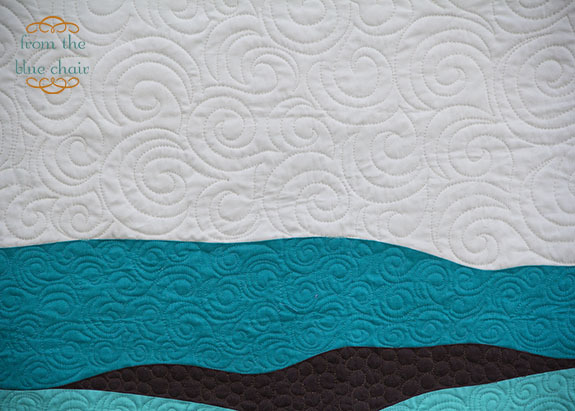 The whites/neutrals are quilted in a much larger swirl for the air. 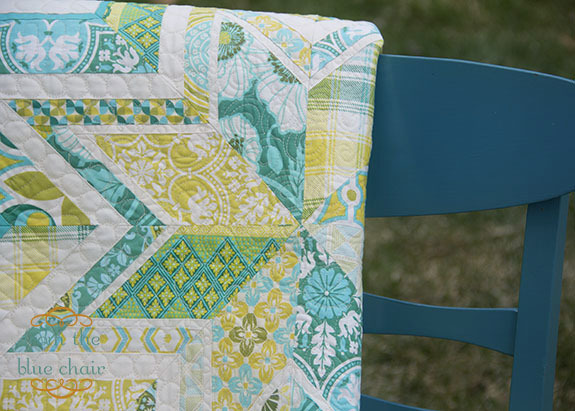 Green is quilted with leaves. 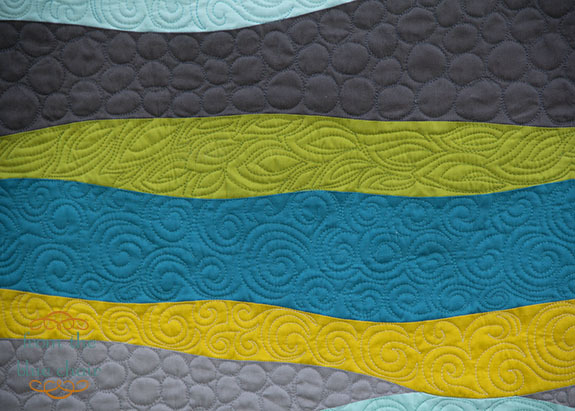 Yellow represents the sun, although I couldn't come up with a good design for sun quilting in such a small space so I chose to quilt it with a swirl as well. 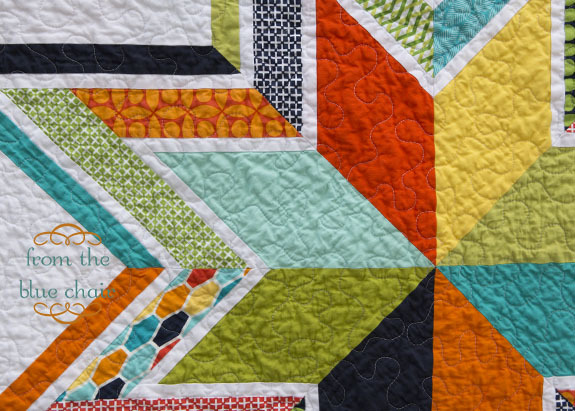 Honestly, I am so excited about the quilting. My quilting skills continue to improve as I brave trying new things. 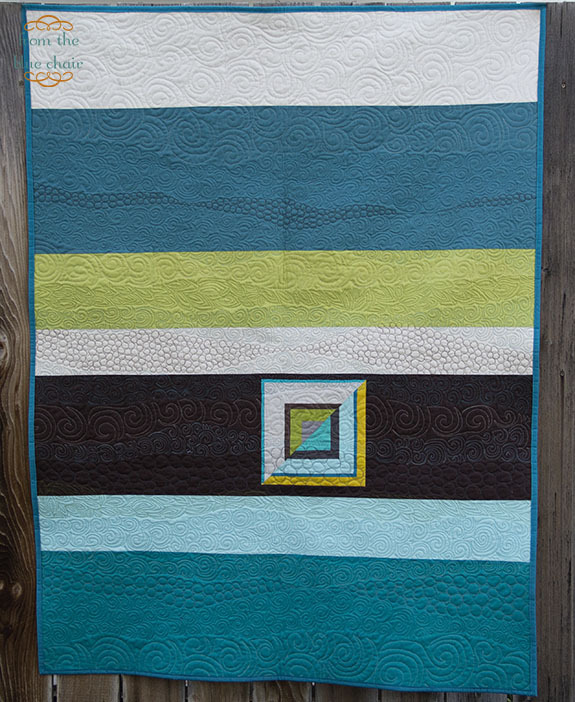 The Craftsy class Machine Quilting Negative Space by Angela Walters that I took several months ago gave me the guts to just try it and get out of my rut. 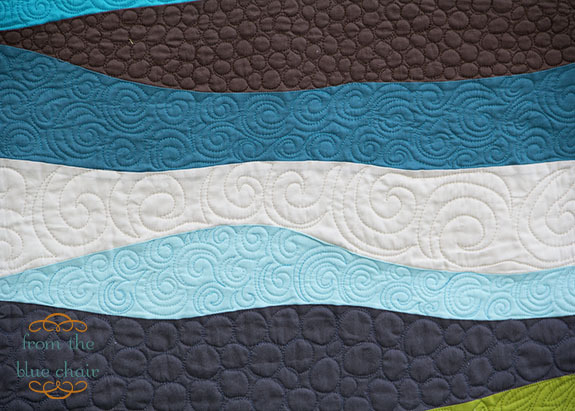 I'm still trying to find the time to start watching the clips for the Free Motion Quilting Sampler Class by Leah Day that I signed up for last month. I think that class will help me a lot as well. 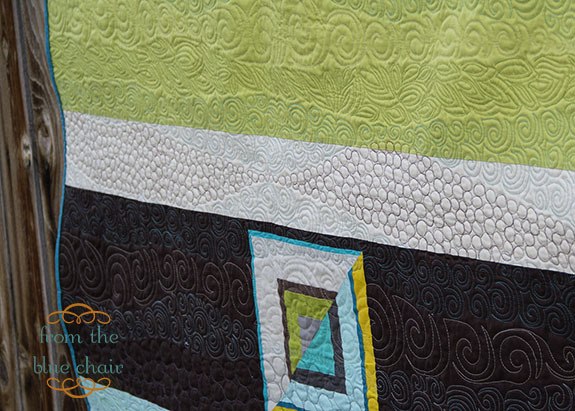 The back is so fun because you can really see the different layers of quilting. Final size is about 42" x 55". I love it! 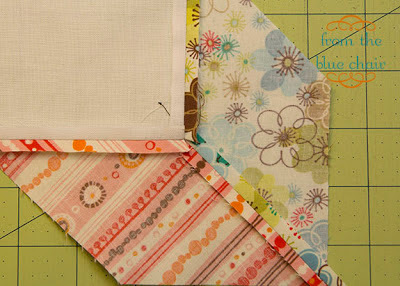 Check out Lily's Quilts for the tutorial on cutting and piecing these layers of fabric. It took me forever to actually start sewing this project. 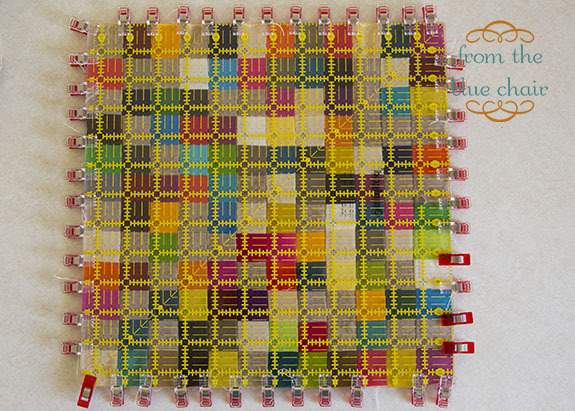 The idea of sewing all these tiny squares together is a little overwhelming. It's a lot of work for very little progress, but I love how they are turning out. I originally planned to make (9) 12" square blocks and piece them together for a 36" wall hanging. That idea changed quickly. 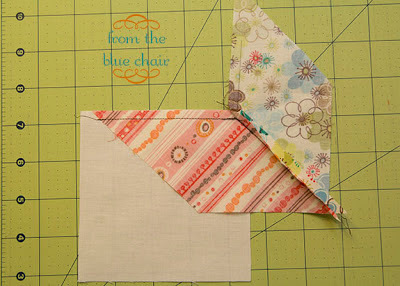 I've now decided to make my blocks all different sizes and sash them with scrappy linen pieces and make a usable quilt. I'm also throwing in various solid blocks of shot cottons. I've made five blocks so far. One was used in a pillow. 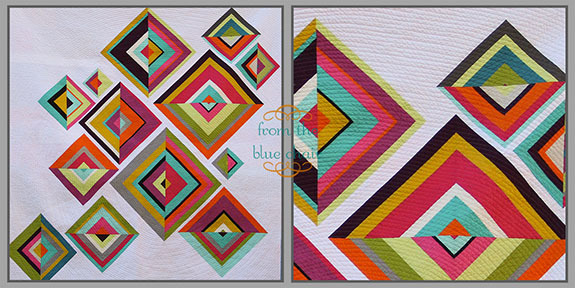 The four blocks below will be included in my quilt. 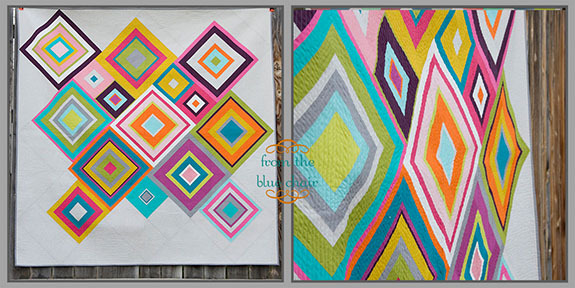 I'm still undecided on how large the quilt will be or how many "confetti" blocks I'll make. I really wanted to try out the interfacing technique with this project. I originally saw it on Oh Fransson then Angela from Cut to Pieces used Stick-N-Washaway from Pellon on her Mario quilt. Since I have recently signed on as a project designer for Pellon I asked if they would be willing to send me some product. They generously sent a bolt of Stick-N-Washaway for me to try out on these blocks. There are pros and cons to this technique. 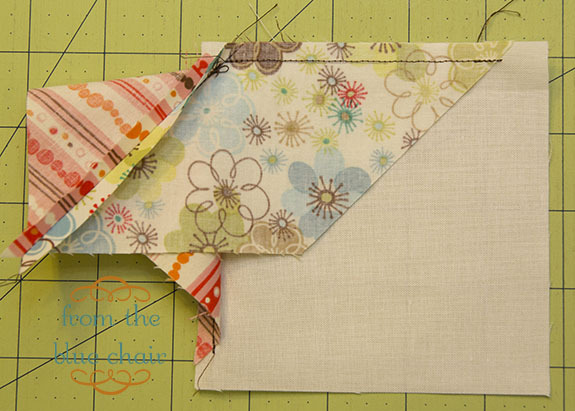 If you are concerned about matching corners, using this interfacing technique really helps. I think it would also be very helpful if laying out a completed design such as Angela's Mario blocks. Although, with several extra steps, I'm not sure it actually saves time. I made three blocks using the interfacing technique. 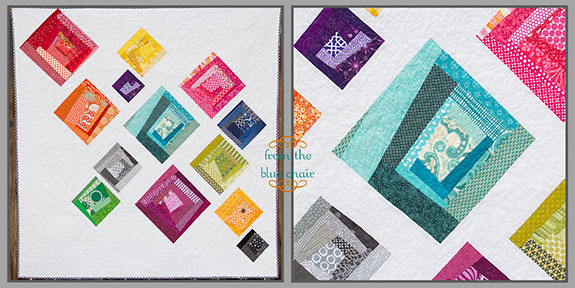 I made two blocks piecing normally. 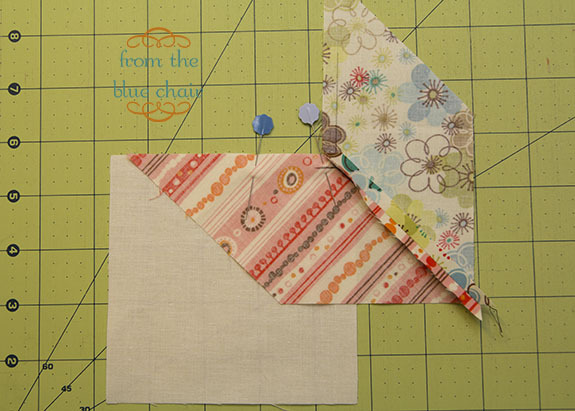 Because I am sewing my squares together randomly, I found that sewing my blocks the old fashion way was a bit easier. The trick is consistency. I have a 1/4" foot with a guide that makes a huge difference for me. 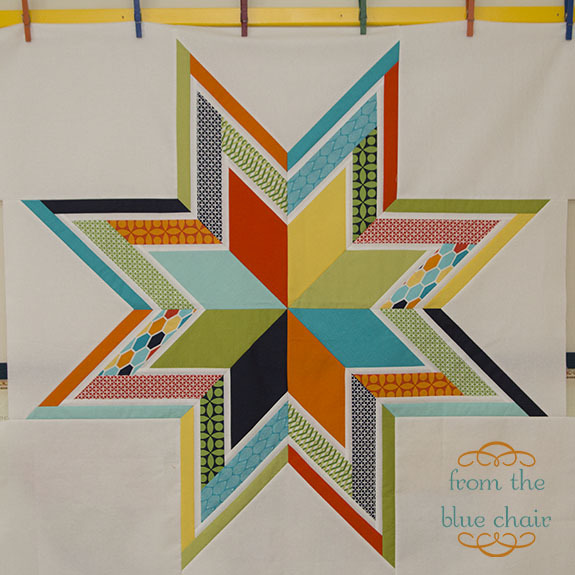 I just chain pieced, and the block came together relatively quickly. I pressed seams to alternating sides for each row so the seams nested well when matching corners. Overall, it really wasn't that painful. 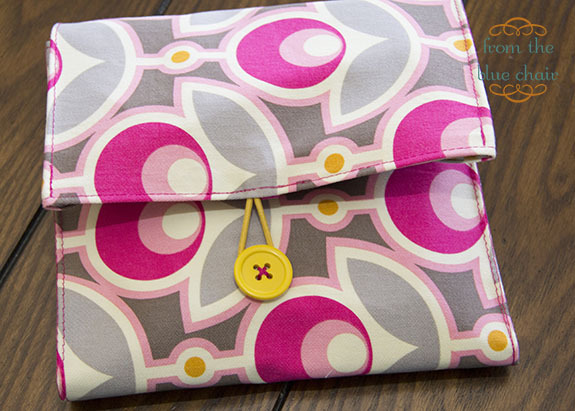 It's pretty brainless sewing that I can do while watching a show on my laptop. In related news, my first official Pellon tutorial is up! 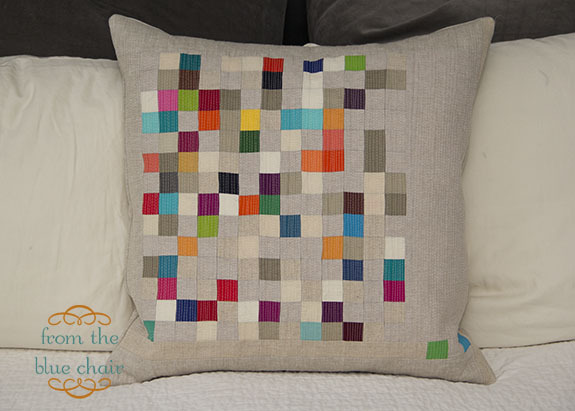 As I mentioned above, I made a pillow using one of my confetti blocks. The full tutorial can be downloaded here. In the tutorial I detail the process of using the Stick-N-Washaway. I found that the blocks can shrink up quite wonky as they are drying. I decided to clip my blocks to an acrylic ruler while they dry to minimize crazy shrinkage. 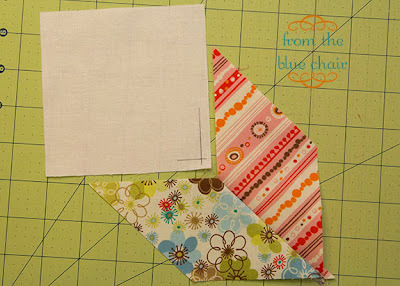 This helped my project, particularly because I'm using a mixture of linen and cotton which shrink at different rates. 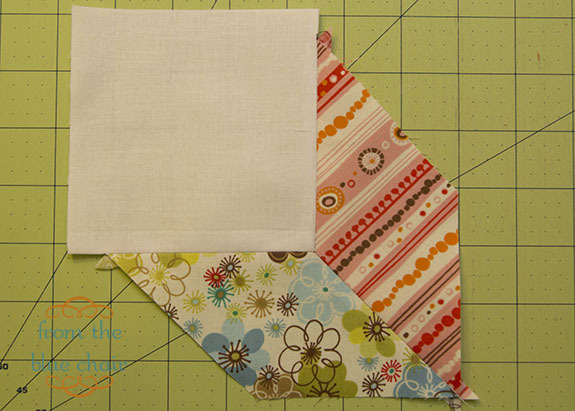 Here's a peak at my pillow I put together for the tutorial using with one confetti block. 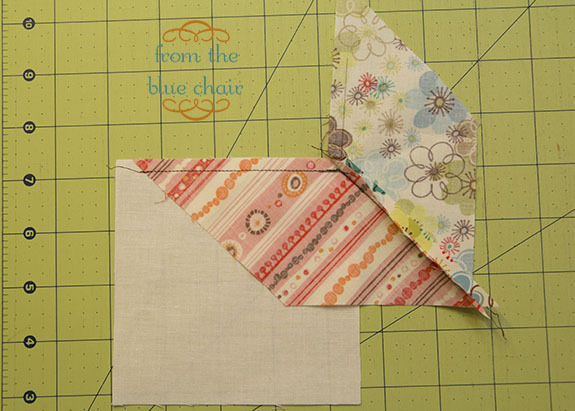 It's a great way to give tiny piecing a try. Courtesy of Pellon, I have some Stick-N-Washaway to pass along to two winners. Just leave a comment and I'll sent out two yards for a couple of you to try. I'll announce winners on Wednesday.